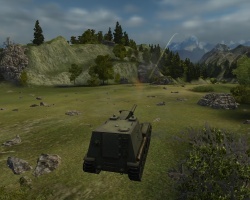 The 212A is a Soviet tier 9 self-propelled gun. Technical requirements for the 212A self-propelled gun were developed in August 1940. The Special Design Bureau No. 2 of the Leningrad Kirov Plant started development based on the KV-220. Blueprints for the vehicle were ready by February 24, 1941, but a prototype was never manufactured. By August of 1941, development was passed on to the UHMP (Ural Heavy Machinery Plant), but a prototype was never built. 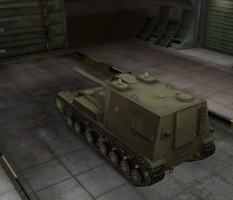 Despite having the same 203mm B-4 gun from its predecessors, the gun characteristics have been upgraded greatly, as it has larger gun traverse and a shorter reload time, also had a big jump in ammunition capacity to 40 shells up from 12 from the S-51 and 16 from the SU-14. However, is much less mobile than its predecessors, and plays at a higher tier. The 212A leads to the Object 261. The 212A plays much like its predecessors with bonuses to various stats, as it has better accuracy and a faster reload than the SU-14-2. However, its horizontal gun traverse is still narrow and its mobility leaves much to be desired. However, its shell arc is higher than even the M53/55, meaning it can hit over cover and hit vehicles that think they are arty safe. as with the other low-mobility artillery pieces, it is not very effective in "TD mode", relying on ambush tactics to land the first shot. NB The 212A is the first Soviet SPG to need a Radio Operator since the SU-26. If you already have an experienced Artillery crew with the Brothers In Arms skill, this may cause you a problem. The 203 mm B-4 Gun and 12RT Radio carry over from the SU-14-2. Mount them immediately. First, research the V-2K forced Engine. Finally, research the 212A enhanced Suspension. Shortly before the war, the KV heavy chassis was the basis for the development of self-propelled guns, one of them being the Object 212A. Work was conducted in SCB-4 LKZ under supervision of J. Kotin, lead designer, appointed by C. H. Golburt. Drafts were submitted for consideration to the ABTU in late 1940, developed under influence of the Soviet-Finnish war in overcoming the long-term fortification of the "Mannerheim Line", which was much more difficult than thought by the Red Army General Staff: to break through it without the help of heavy artillery was simply impossible. In some cases, the firing of heavy guns was conducted on the Finnish border, which was not always possible while under heavy fire resistance. The problem could be solved with large-caliber SPGs, but such machines were not in test trials until early February 1940, when the enemy's defenses had been breached. Since the urgent need for this kind of self-propelled gun had decreased, Project T-100-Y and SU-14-1 became preferred more than the KV-2 tank. In this situation, Kotin decided independently to develop the heavy self-propelled guns class, which could be used for attacks on the rear of the enemy, or used on his front line of defense. 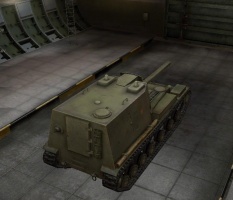 For future self-propelled gun was chosen: the 152.4mm Br-2, which was previously installed on the Su-14 model 1937. This gun was created by the Bureau of Factory "Barricades" in 1931. Comparative tests with the B-30 gun were initially rejected, but for un-clear reasons, still entered service. The choice of the BR-2 was less than optimal since the gun itself had several design flaws, and its prototype was almost destroyed due to a rupture of the barrel. Nevertheless, during the years 1937-1940, 37 guns were fired, which later became part of the heavy cannon Regiment Reserve of the Supreme Command Headquarters. Nevertheless, for all its shortcomings (low mobility, the complexity in manufacturing, low lifespan of the barrel), the BR-2 had a high capacity. Ammunition for the BR-2 consisted of two types; high-explosive 53-PF-551 weighing 48.9 kg and betonoboynymi 53-D-551 weighing 49 kg. Muzzle velocity of the 53-PF-551 is 880 m / s, with maximum range of 25 km. Contact with any of these shells against a tank or armored personnel carrier resulted in their complete destruction. The gun itself consisted of a barrel (up 47.2 gauge), loader piston type, mast, hydraulic brakes, and hydropneumatic recuperator rollback. Loading guns - kartuznoe, but to facilitate the flow of shells from the ground, it had a special crane used for hoisting. In order to build this artillery system, HF had to significantly modify the chassis. The number of rollers was increased from 6 to 7, with the rear of the distance between them having been reduced, and in the middle (less loaded) it was increased. 4 support rollers remained, but changes in the layout moved the driving wheel forward. A swivel wheel with a screw mechanism for track tensioning is now located on the rear. The suspension of self-propelled guns remained independent torsion. 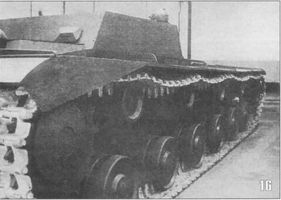 Self-propelled caterpillar design was melkozvenchatoy with a width of 660 mm tracks. Changes to the chassis were made because a full redesign of the layout. The fighting compartment was located behind and partially in the middle part of the body. Another compartment, where the driver and the radio operator were placed, was between the transmission and engine compartments. The hull was welded and assembled from rolled armor plates with thickness' of 20, 30, 50, and 60 mm. The BR-2 cannon is installed in the wheelhouse and equipped with a telescopic sight. Pointing angles were rather modest and ranged from -3 to 15 vertically and - \ 8 on horizontally. Despite the fact that the shells were now literally "at hand", the loading was severely difficult due to their weight. In order to facilitate the loading, provision was made for the installation of a special pan like the M-10 howitzer of the heavy tank, KV-2. The selection of ammunition for the gun was increased with the addition an armor-piercing projectile weighing 51.07 kg, which had an initial velocity 860 m / s and at a distance of 5000 meters, could penetrate 40-mm armor. To protect against infantry, the Object 212 was equipped with three machine guns, the DT 7,62 mm. One of them was placed in the frontal case, the second in the the crew compartment, the third was at the zenith, and had to be mounted on a turret on the roof of the crew compartment. Ammunition for the guns were 47 artillery rounds for the BR-2 and 3000 rounds for the machine-guns. By comparison, the KV-2 heavy tank came with 36 tank shells and 3,087 machine gun rounds. 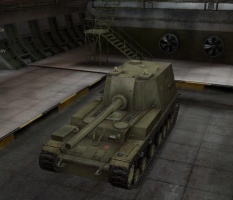 Since the estimated mass of the object 212A approached 65 tons, a heavy-duty engine was needed. The option chosen was the 2-engine combination drive with a centrifugal supercharger, which was supposed to reach a maximum capacity of 850 hp. This would allow a maximum speed of 35 km / h and a cruising range on the highway of about 200 km. External communication was with the 71-TC-3M radio and whip antenna, and internal communication (most likely) among the crew members would be an intercom system, ie: the TPU or TPU-3-3bis-F. Although the heavy self-propelled gun had lost its initial priority, it was approved by the Project 212A ABTU and was accepted for implementation. SAU sought to hold on to building LKZ, and in December 1940, was sent a set of working drawings for the construction of the body. However, at this time the company was heavily loaded with orders for the release of the KV-1 and IS-2, where on completion, were thrown into the main forces of the Kirov. 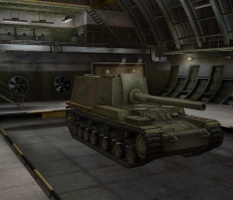 In addition, in April 1941, preparatory work began on the production of the KV-3 (the first version with a lengthened chassis and a 76.2-mm gun), so the ACS forces had no choice. Final assembly of the unit was delayed until June 1941, and after the war, considered not up to the level of "assault" self-propelled guns. Perhaps it could be brought to sea trials, but did not have time to put the LKZ chassis on for ACS. As a result, the self-propelled gun was disassembled and Object 212A reduced to metal. This page was last modified on 26 September 2018, at 04:11. This page has been accessed 305,015 times.